In a non-stick pan, heat vegetable oil for pan frying. Make the croquettas: in a mixing bowl, combine mashed kamote, carrots and spring onion. Season with seaweed and salt and pepper. May add some honey. 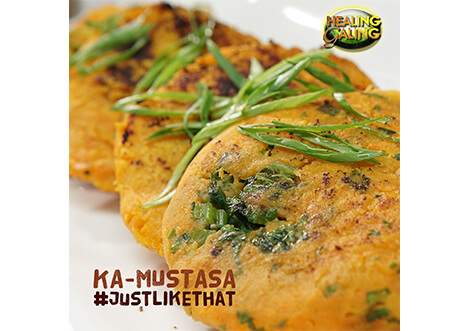 Mold in the palm of your hand and add some chopped and blanched mustasa leaves as a “palaman”. Pan fry until a bit golden. Drain excess oil in paper towels before plating.